Barbra Joan Streisand (fødd 24. apríl 1942) er ein amerikonsk songkvinna, sangskrivari, sjónleikari og filmsleikstjóri. Gjøgnum hennara yrkisleið ið hevur vart í seks áratíggju, er hon blivin eitt ikon í fleiri ymiskum greinum innan undirhaldsvinnuna og hevur vunnið nógvar heiðurslønir, og hevur fingið kelinavnið Queen of The Divas. Hon hevur vunnið tvær Oskar, tíggju Grammy Awards teirra millum Grammy Lifetime Achievement Award og Grammy Legend Award, fimm Emmy Awards teirra millum Daytime Emmy, eina Special Tony Award, eina American Film Institute virðisløn, eina Kennedy Center Honors virðisløn, fýra Peabody Awards, The Presidential Medal Of Freedom og ellivu Golden Globe virðislønir. Hon ein av fáum ið hava vunnið bæði Emmy, Grammy, Oscar og Tony virðisløn. ↑ Lynch, Joe (2 August 2014). "Top 10 Richest Female Pop Stars". The Richest. The Richest. http://www.therichest.com/expensive-lifestyle/money/top-10-richest-female-pop-stars/?view=all. Heintað 3 December 2014. ↑ "Barbra Streisand goes back to Brooklyn, and beyond". USA Today. 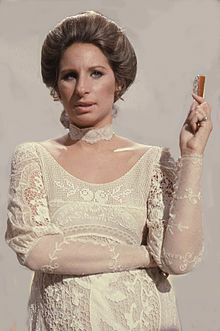 October 8, 2012. http://www.usatoday.com/story/life/music/2012/10/07/barbra-streisand-2012-tour/1616027/. Heintað July 26, 2013. ↑ "Lessons from Barbra Streisand". Chicago Tribune. November 6, 2006. http://articles.chicagotribune.com/2006-11-06/news/0611060290_1_barbra-streisand-trainees-gay. Heintað July 26, 2013. ↑ "Barbra Streisand: Queen of the divas". the Daily Mail. July 19, 2007. http://www.dailymail.co.uk/femail/article-469419/Barbra-Streisand-Queen-divas.html. Heintað July 26, 2014. ↑ "Ireland awaits the arrival of the queen of divas". July 13, 2007. http://www.irishtimes.com/news/ireland-awaits-the-arrival-of-the-queen-of-divas-1.809532. Heintað July 26, 2014. ↑ "The internet's best Barbra Streisand memes". April 24, 2015. http://www.asos.com/women/fashion-news/2015_04_24-fri/barbra-memes-for-barbra-streisand-73rd-birthday/. Heintað July 26, 2014. ↑ "After 51-year absence, Barbra Streisand takes the host chair at 'The Tonight Show'". The Washington Post. July 13, 2014. http://www.washingtonpost.com/news/morning-mix/wp/2014/09/16/after-51-year-absence-barbra-streisand-takes-the-host-chair-at-the-tonight-show/. Heintað July 26, 2014. ↑ "Barbra Streisand at her MusiCares Person of the Year dinner at the LA Convention Center". February 12, 2011. http://www.hollywoodnews.com/2011/02/12/barbra-streisand-at-her-musicares-person-of-the-year-dinner-at-the-la-convention-center/. Heintað July 10, 2014. ↑ "Academy Awards Database". Academy of Motion Picture Arts and Sciences. January 29, 2010. http://awardsdatabase.oscars.org/ampas_awards/DisplayMain.jsp?curTime=1343277311952. Heintað July 26, 2012. ↑ "Barbra Streisand Goes Platinum for History-Making 31st Time with Partners". Broadway World. January 20, 2015. ↑ "Awards Search". Academy Of Television Arts & Sciences. http://www.emmys.com/awards/nominations/award-search?search_api_views_fulltext=Barbra+Streisand&field_is_winner%5b1%5d=1&submit=Search&search_api_views_fulltext_1=&search_api_views_fulltext_3=&search_api_views_fulltext_2=&search_api_views_fulltext_4=&field_nominations_year=1949-01-01+00%3A00%3A00&field_nominations_year_1=2013-01-01+00%3A00%3A00&field_nomination_category=All. Heintað December 10, 2013. ↑ "AFI Life Achievement Award: Barbra Streisand". American Film Institute. http://www.afi.com/laa/laa01.aspx. Heintað December 9, 2009. ↑ "The Ultimate Show Biz Coup: PEGOT". The Peabody Awards. http://www.peabodyawards.com/stories/story/the-ultimate-show-biz-coup-pegot. Heintað December 10, 2014. ↑ Johnson, Ted. "Steven Spielberg, Barbra Streisand to Receive Presidential Medal of Freedom". Variety. http://finance.yahoo.com/news/steven-spielberg-barbra-streisand-receive-presidential-medal-freedom-212322362.html;_ylt=A0LEVi14mUpWtjcA6Y0PxQt.;_ylu=X3oDMTByMjB0aG5zBGNvbG8DYmYxBHBvcwMxBHZ0aWQDBHNlYwNzYw--. Heintað 17 November 2015. ↑ "Awards Search". Hollywood Foreign Press Association. http://www.hfpa.org/ggasearch/?q=barbra+streisand. Heintað December 10, 2014. Hendan síðan var seinast broytt 17:26, 12. des 2015.